Just take the elevator down and your toes are in the sand! Stroll along the water or on the quiet, upscale Sail Bay boardwalk or ride our 4 provided Beach Cruiser bikes on the miles and miles of bay and ocean boardwalks. Sip wine on your balcony as you watch the sunset or walk around the bay ten minutes to the ocean to catch a glimpse of the 'green flash' just as the sun goes down. At night two big paddle wheel boats cruise the bay, all lit up. Moonlight and lights f the strand across the bay reflection off the water. 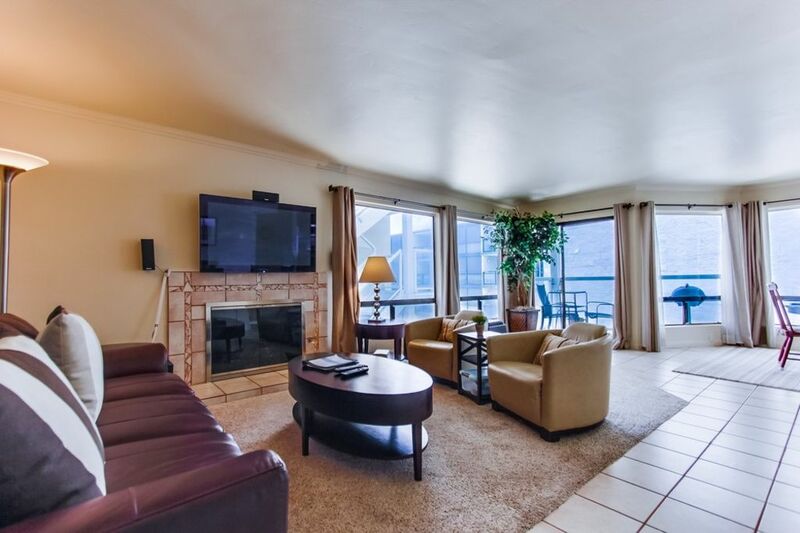 This large 1350 sq ft condo features California-style open kitchen, gas fireplace, gas BBQ, 50 inch plasma TV, plus 2 other TV's in the bedrooms, DVD, WiFi, and 4 bikes! Beds are king, queen, double, single and a queen sofa bed. Fanuel Park Children's playground is only 350 yards away. Quiet Enjoyment - Rest and Relaxation: * This is a quiet building in a quiet, upscale beach area with mostly full-time owner-residents whom we would like to stay on good terms with. We have the only condo building that even allows vacation rentals on the entire East side of Sail Bay looking West. We try our hardest to weed out and not rent to inconsiderate people who want to party, drink too much and disturb others. *Relax in the fresh sea breeze and enjoy the peace of the east side of Mission bay, while still being close to all of San Diego's popular attractions. * This complex is for couples and families. As of Jan 1, 2008 no alcoholic beverages are allowed on all San Diego beaches. Going the extra mile for your enjoyment: * The ocean and bay boardwalks are wonderful for bike riding so we provide new beach cruiser bicycles for you, just like you rode as a kid. No fancy gears, just a plain bike with a big comfortable seat, high handlebars, a kickstand and back-peddle brakes. There is a gas BBQ (with gas provided! ), laundry room on each floor of the building and a well lit underground parking garage with garage door opener. WiFi Cable/wireless Internet and phone line insures that you can keep in touch with work if necessary and there is Cable TV and DVD. The unit has a small private patio with a table and two chairs and gas BBQ. The dining table is right there by the door out to the patio with a view of the bay. You will find beach chairs, beach umbrella, beach towels, beach toys for the kids, alarm clock, ironing board and iron, hair dryer, shampoo, dishwasher soap, body and hand soap, laundry soap and bounce sheets, coffee filters, saran wrap and aluminum foil, kleenex, paper towels, toilet paper, etc. The bathrooms have recently been remodeled. Master bathroom has dual sinks with granite countertops, travertine tile tub surround and travertine tile floor. The second bathroom has tumbled travertine counters and a wood floor. They are lovely. There are a total of 3 TV's. One is in the living room, one in the Master bedroom, and one in the room with bunk beds. Ask if this unit has A/C! Great place for multiple generations! This condo on the bay turned out to be great for a multi-generational vacation. Our daughter and son-in-law and two children joined us for a week, so we appreciated the 3 bedrooms, 2 baths, and the garage parking. The broad concrete walk in front of the building was great --we walked a lot, and used the bikes that came with the condo, as well as the scooters that were for available nearby for rent, just for fun, and to travel to Sea World and Belmont Park. San Diego is so close--we spent time at Balboa Park, the New Children's Museum (our grandsons, 7 & 9 loved the rough and tumble room and the Wonder Room), and the USS Midway. We prepared most meals in the condo--the only things we wanted for were better frying pans, a casserole dish, and serving dishes for a crew, but we managed (and left a baking pan we bought). Thanks for the feedback Rona. We hope your family enjoyed the vacation. Super location, spacious, well-stocked; we thoroughly enjoyed our stay here! Overall, this was a great space for our family vacation. - Great location! It was easy to visit Sea World, the zoo, the beach, etc. We loved that the Mission Bay beach was right out our window. It was about a 20 minute walk to the ocean. In addition, we frequented the playground that was just a short walk away down the beach. - The condo was spacious. We had family and friends over for dinner a couple nights, and there was plenty of room for the kids to play. - It was well-stocked. There were plenty of towels (both bath towels and beach towels). Shampoo, conditioner, body wash, and soap were provided. There was also a hair dryer. Best for us - there was a high chair and a booster seat, as well as some play doh and an art kit (presumably left by previous guests). The sand toys were nice as well. - We emailed ahead of time about an early check-in and called when we arrived. They said it was fine to come early but warned us maintenance workers would probably come while we were there, as the condo was scheduled for a heater repair and some restocking. When we arrived, there was tape blocking the elevator entrance because of wet paint on the floor. The painter said we would have to come back later. We had two small children who needed to nap, and it was mostly dry, so we were able to tiptoe to our door, but it was unfortunate. Also, the heating repairman was friendly, but he commented that he didn't know we would be checking in early. The communication could have been better. In addition, someone came to be sure we had the pack n play we had paid extra money for. I replied that yes it was there (it was in a closet), but I do wonder if it was already there (like the high chair and booster seat), in which case, I wish I wouldn't have paid extra for it. - The TV was difficult to figure out, although there were posted directions. We still found it complicated. - Plastic cups would have been nice for kids. In an email, the Nancy's Vacation Rentals staff were receptive to this suggestion. Again, overall, we were extremely pleased with our stay here and would stay here again. It was wonderful to have you all as our guests! Thank you so much for the kind review, we're very happy you had such a great stay and look forward to having you back with us in the future! Great home perfect for families by Mission Bay, calm waters. Easy access to highways to get around. Really enjoyed our stay here, remodeled condo was very comfortable and easy access to mission bay for the kids. Came with all the needed beach supplies. Safe and secure location. Thanks for the great week! We really enjoyed everything about this condo. It was exactly as advertised. Plenty of space for four adults and one teen. The condo was clean, very close to the water and in a great location. The beds were comfortable, the condo came abundantly equipped (plenty of dishes, extra towels, beach towels, etc). Other than food, there was nothing we needed to purchase to enjoy our week. The condo also came with 5 bikes, two boogie boards, beach chairs and a beach umbrella. Having central air was a nice bonus. Although the temperatures were always beautiful outside, it was a nice feature to have while sleeping. We were actually suprised at how close we were to the water. The view from the balcony isn't unobstructed, but it's quite nice. Our only drawback was another condo owner who apparently likes to randomly take up the parking for this condo. But we contacted Nancy's and they were incredibly responsive. They provided a new place for us to park and assured us they would be addressing it with the neighbors. Overall I would rate this a great experience. I would not hesitate to rent from Nancy's Vacation Rentals again. They were professional, polite and very responsive to any questions/issues. Other Activities: Biking on the boardwalks, walking on the beach or boardwalks, Boating, Mimi-golf, para-sailing, kayaking, seabird estuaries and more!